I don’t know about you but I almost never dream about food even though that seems kind of strange for someone who has a food blog and loves to cook. Anyway the other night I had a dream that I made this recipe and people were swooning over it! As soon as I woke up I headed to the kitchen and went right to work on getting a pan of this ready for the oven. It is definitely swoon worthy which is why I am sharing it today. This is going to be a wonderful Christmas dessert, breakfast or snack. 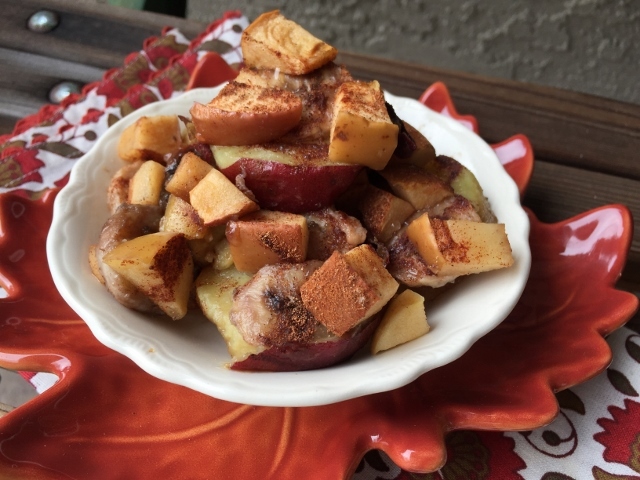 Julie Latz who is a fellow Chef AJ Ultimate Weight Loss member created this recipe and was kind enough to share it on our private UWL facebook page. She gave me permission to share her creation and when I asked her what we should call it she came up with How Sweet It Is. That pretty much sums up this recipe. It couldn’t be easier to make yet it is insanely sweet and delicious. Delight your family and friends by serving this along side some oatmeal for breakfast or as dessert or a snack with a big mug of hot herbal tea. If you want to guild the lily serve this warm from the oven with some banana soft serve. Are you drooling yet? There is no added sugar, salt or oil in this recipe but the Japanese sweet potatoes, bananas and apple are naturally sweet. Cinnamon, nutmeg and ground cardamon add even more sweetness and your kitchen will smell heavenly while this bakes. 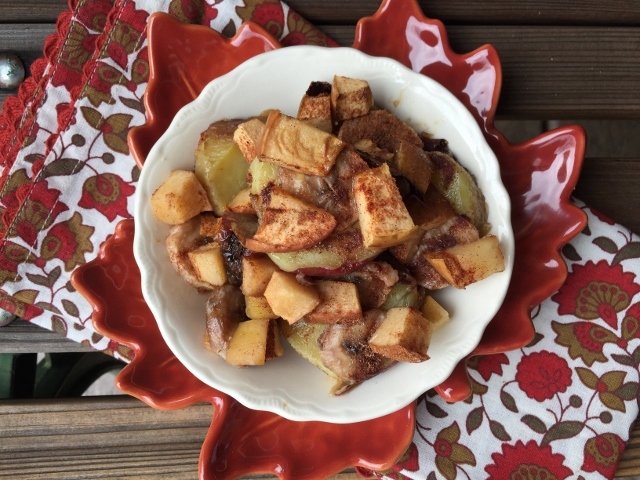 It will add a little healthy sweetness to your holiday menu! 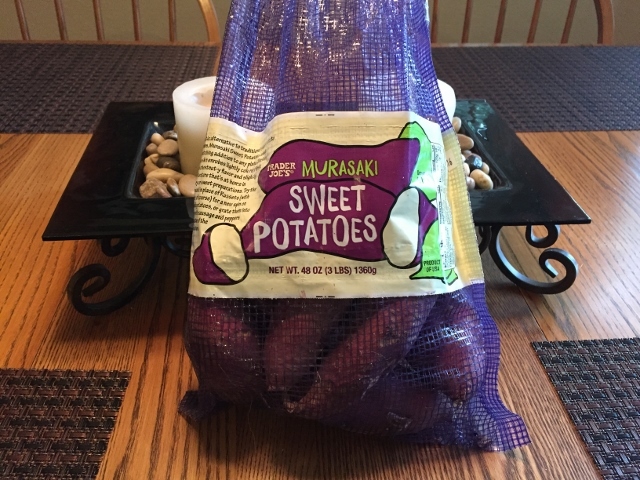 These are the Japanese Sweet Potatoes that Trader Joe’s sells. They are purple on the outside and cream colored inside. They are sweet with s a slight vanilla flavor. They are unlike any other kind of sweet potato I have tried. It wasn’t until I adopted a whole food plant based lifestyle that I discovered so many different varieties of sweet potatoes even existed. If you don’t have a Trader Joe’s, Whole Foods sells Japanese Sweet Potatoes and so do Asian markets or markets that cater to Asians. Julie cooks her sweet potatoes in the pressure cooker – sliced into 2 inch rounds and pressure cooked for 6 minutes. I do prefer mine baked whole in the oven at 400 degrees for about an hour. They get all soft and super sweet. As you have seen in my batch cooking video and Batch Cooking blog posts I like to bake a few trays of all kinds of potatoes once a week. They hold well in the fridge for 7-10 days and can be used in a variety of ways through out the week for quick and easy meals. This is so easy – slice your cooked sweet potatoes and put a layer on the bottom of a casserole dish. The next layer is sliced ripe banana, then a layer of chopped apple. Sprinkle with cinnamon and my additions of freshly ground nutmeg and a little ground cardamon. 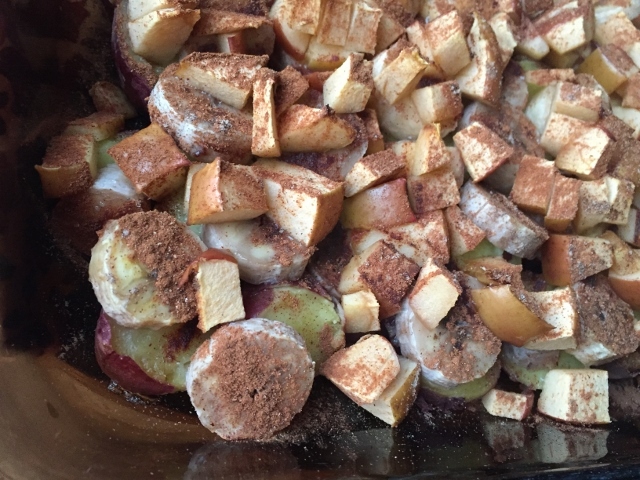 Place into a preheated 350 degree oven for 25-30 minutes or until the apples are tender. A big thank you to Julie for creating this recipe and sharing it’s sweetness with us! It will add some healthy cheer to your holiday cooking. Julie cooks her Japanese Sweet Potatoes in the pressure cooker – cut into 2 inch rounds for 6 minutes. I bake my JSP whole in the oven at 400 degrees for about an hour or until cooked through. I think it makes them sweeter when baked. There are no quantities – just use as many sweet potatoes as it takes to cover the bottom of your casserole dish. Make as much or as little as you like. For the second layer cut bananas into 1/2 inch slices and cover the JSP layer. The third layer is the diced apples. Sprinkle with spices to taste. Bake for 25-30 minutes or until apples are tender. Serve warm or cold. It’s insanely delicious! Recipe created by Julie Latz. Enjoy Amy! It is so good!